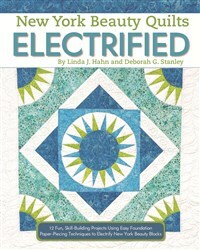 Linda J. Hahn is a National Quilting Association (NQA) Certified Teacher and former NQA Teacher of the Year. Her bestselling quilting books have won multiple Independent Publishers Book Awards with Gold, Silver and Bronze Medals. Linda was named "New Jersey All Star Quilter" by the State Quilt Guild of New Jersey, and has been nominated three times for Professional Quilter Magazine's Teacher of the Year Award. Her work has been published in numerous national quilting magazines. Linda designs quilt patterns for RJR Fabrics and Clothworks, Inc., and markets her own quilt patterns under the name Frog Hollow Designs. She actively lectures and presents workshops for shows and guilds throughout North America. Deborah G. Stanley is an independent designer, whose work has been published in many magazines, including Quilt magazine, Love of Quilting, Modern Patchwork, American Quilter, and Quilter's World. She has designed consumer projects for several fabric companies, including Nothcott, RJR, and Elizabeth's Studio. Her specialty is simple, easy-to-complete sewing and quilting projects, especially lap quilts and handbags.